WILLEMSTAD - The air quality around the oil refinery Isla is not as good as was announced by the Minister of Public Health, Suzanne Camelia-Römer last week. This is according to the environmental organization SMOC. According to the organization, the measurement was done for a short period of time and took place on in the neighborhood Julianadorp. A neighborhood that is quite not in the pollution danger zone. The other measuring stations still indicate a too high concentration of toxic substances. 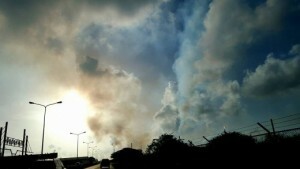 The environmental organization is pleased that the air quality in Julianadorp is clean. Last week the Minister reacted with excitement to the results of the air quality measurements around the refinery. She even presented the report made by the Amsterdam Health Department (GGD) to the Dutch Minister of Defense Jeanine Hennis-Plasschaert. The measurements were started in May 2016 by the Dutch Ministry of Defense, which, as an employer, voiced its concerns about its personnel in Julianadorp. The results and preliminary conclusions of the GGD were also assessed by the Coordination Center Expertise Working Conditions and Health (CEAG) of the Minister of Defense.